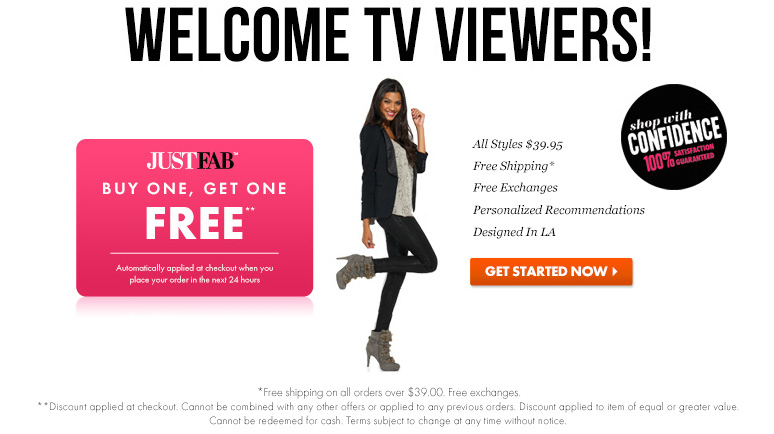 Welcome to JustFab! This website located at www.justfab.com (this "Site") is owned and operated by Just Fabulous, Inc. (the "Company") and JFGC, LLC ("JFGC" and, collectively with the Company, "JustFab"). JustFab provides website features and other products and services to you when you visit, shop or purchase items from this Site, use JustFab services, access this Site from your mobile devices, or use software provided by JustFab in connection with any of the foregoing (collectively, "JustFab Services"). JustFab provides its products and services subject to these Terms of Service. By using JustFab Services, you agree to these conditions. Please read them carefully. By accessing or using this Site, mobile application or other JustFab product or service on any computer, mobile phone, tablet, console or other device (collectively, "Device"), you acknowledge and agree that you have read, understand and agree to be bound by these Terms of Service and any other applicable law, whether or not you are a registered member of JustFab. JustFab may change these Terms of Service at any time without notice. When we make changes, we will post them here. Your continued use of the JustFab Services or enrollment as a JustFab VIP Member shall be considered your acceptance to the revised Terms of Service. If you do not agree to these Terms of Service, please do not use this Site or any JustFab Services and immediately cancel your JustFab VIP Membership by calling one of our customer service representatives at 1-866-337-0906. You must be at least 18 years old to use this Site or Services. When you use any JustFab Service, or send e-mails to us, you are communicating with us electronically. You consent to receive communications from us electronically. We will communicate with you by e-mail or by posting notices on this Site or through the other JustFab Services. You agree that all agreements, notices, disclosures and other communications that we provide to you electronically satisfy any legal requirement that such communications be in writing. JustFab offers members the opportunity to participate in its membership rewards program (the "VIP Membership Program"). To become a JustFab VIP Member, simply purchase any JustFab item on this Site or through an applicable JustFab Service and you will be automatically enrolled in the JustFab VIP Membership Program (including the monthly, automatic purchase feature). As a JustFab VIP Member, our experts will send you a customized selection of JustFab items on the 1st day of every month. You will also receive emails, newsletters, special offers and other updates to maximize your shopping experience. As a valued JustFab VIP Member, you will enjoy exclusive VIP Member-only pricing and dedicated promotions. You may cancel your JustFab VIP Membership at any time by calling one of our customer service representatives at 1-866-337-0906. Upon enrollment in the VIP Membership Program, you will receive new monthly customized selections of merchandise on the first (1st) day of every month. You must make a purchase or log into your account and select the 'Skip the Month' option between the 1st and 5th day of the month. If you do not make a purchase and do not 'Skip the Month' your credit card will be charged an automatic monthly membership fee of $39.95 for a member credit on the 6th until you cancel. You may cancel your JustFab VIP Membership at any time by calling one of our customer service representatives at 1-866-337-0906. Each JustFab credit will be applied to your Account and can be redeemed toward the purchase of JustFab items (totaling $39.95 or higher) during your purchase checkout in any future month. You may 'Skip' as many months as you like, there is no obligation to buy. Even if you decide to 'Skip' any month, you may return to your Account at any time to make a purchase. As discussed below, any unused membership credits will be automatically converted into an electronic JustFab gift card twelve (12) months following issuance. The electronic gift cards never expire and work the same as membership credits, except that they are transferable and can be used to purchase JustFab items of any price. You may cancel your JustFab VIP Membership Account at any time. If you wish to cancel your Account, simply call our Fashion Consultants at 1-866-337-0906 anytime, 24 hours a day, 7 days a week. There is no cancellation fee. Please be advised that your Account may only be canceled by the registered JustFab VIP Member or the holder of the valid credit card on file related to your Account. As a JustFab VIP Member, you will be able to purchase JustFab branded items including, but not limited to, apparel, shoes, handbags, denim and other fashion items at exclusive member only discounted prices. You will also receive free shipping on all order over $39.00. In order to bring you this fabulous pricing, we must charge a $4.95 shipping fee for all orders under $39.00, after applicable discounts. Exchanges are also free and returns are easy! In addition, JustFab will occasionally collaborate with premier trendsetting partners to offer specialty items at exclusive members-only prices. As a JustFab VIP Member you will also have access to exclusive member-only sales and discounts, and special collections. JustFab is always striving to create the best shopping experience to its VIP Members so additional benefits and perks may be added. Any membership credits issued to you will be automatically converted into electronic gift cards("JF Gift Cards") if they are unused following the twelve (12) month anniversary of issuance. As describebelow, JF Gift Cards function almost identically to membership credits, and both constitute prepaid promotional certificates that are provided to VIP Members in connection with the VIP Membership Program. JF Gift Cards can be used by you to purchase identified merchandise at a price below the regular retail price if you are a VIP Member at the time of redemption. Non VIP Members can also use JF Gift Cards to purchase JustFab merchandise at the regular retail price. Additionally, JF Gift Cards are freely transferable and can be broken and applied across multiple purchases on this Site or the JustFab Services. Membership credits and gift cards are not refundable or redeemable for cash. Membership credits and gift cards can only be used toward purchasing JustFab items on the Site or through the JustFab Services. Membership credits may only be redeemed in one transaction and are non-transferable. JustFab gift cards may be redeemed in multiple transactions and are transferable. Once you use the JustFab gift card any remaining value from the gift card will be automatically credited back to your Account under the "store credit" section. You may transfer JustFab gift cards to family members or friends who may want to try the JustFab Service. Use of the JustFab Services, membership in the JustFab VIP Membership Program, any purchases made through the JustFab Services, and any controversy, claim or dispute arising out of or relating in any way to your use of the JustFab Services, your membership in or purchases through the JustFab Services, JustFab VIP Membership Program and/or your Account, or products purchased through the JustFab Services shall be governed by the laws of your home state of residence without respect to its choice (or conflict) of laws rules. Any claim or cause of action you may have with respect to JustFab or the JustFab Services must be commenced within one (1) year after the claim or cause of action arose. Agreement to Pre-Arbitration Notification These Terms of Service provide for final, binding arbitration of all disputed claims (discussed immediately below). JustFab and you agree, however, that it would be advantageous to discuss and hopefully resolve any disputes before arbitration proceedings or any other proceedings authorized herein are initiated. In the event of a dispute, the claimant whether you or JustFab shall send a letter to the other side briefly summarizing the claim and the request for relief. If JustFab is the claimant, the letter shall be sent, via email, to the email account listed in your Account. If you are the claimant, the letter shall be sent to Just Fabulous, Inc., Attn: General Counsel, 800 Apollo Street, El Segundo, California 90245. If the dispute is not resolved within 60 days after the letter is sent, the claimant may proceed to initiate arbitration proceedings or any other proceedings authorized herein. Except to the limited extent noted below, use of the JustFab Services, membership in the JustFab VIP Membership Program, any purchases made through the JustFab Services, and any controversy, claim or dispute arising out of or relating in any way to your use of the JustFab Services, your membership in or purchases through the JustFab VIP Membership Program, or products purchased through the JustFab Services shall be resolved by final and binding arbitration between you and JustFab. If you decide to commence arbitration, the provider will require to you to pay a filing fee (which currently is $125 for claims under $10,000). If your filing fee is more than $125, JustFab will reimburse you for any excess fee promptly after it receives notice of your arbitration. If the arbitrator ultimately rules in your favor, JustFab will also reimburse you for the $125 base filing fee. If the arbitrator rules in your favor in any respect on the merits of your claim and issues you an award that is greater than the value of JustFab's last written settlement offer made before an arbitrator was selected (or greater than zero if no offer was made), then JustFab will pay you the amount of the award or $350, whichever is greater (in addition to reimbursing you for the base filing fee). Both you and JustFab waive the right to bring any claim covered by this dispute resolution provision as a class, consolidated, representative, collective, or private attorney general action, or to participate in a class, consolidated, representative, collective, or private attorney general action regarding any claim covered by this dispute resolution provision brought by anyone else. You may elect to opt out (exclude yourself) from the final, binding arbitration procedure and the class action waiver specified in these Terms of Service by doing the following: within 15 days of setting up your Account, you must send a letter to Just Fabulous, Inc., c/o Legal Department, 800 Apollo Street, El Segundo, California 90245 that specifies (1) your name, (2) your account number or account member name, (3) your mailing address, and (4) your request to be excluded from the final, binding arbitration procedure and class action waiver specified in these Terms of Service. All other Terms shall continue to apply to your Account, including the requirement to participate in pre-dispute mediation. Notwithstanding any provision in these Terms of Service to the contrary, we agree that, if JustFab makes any future change to the dispute resolution procedure and class action waiver provisions (other than a change to JustFab's address), you may reject any such change by sending a letter to JustFab within 15 days of the change to the address provided above. By rejecting any future change, you are agreeing that you will arbitrate any dispute between us in accordance with the language of this provision. Your letter must be postmarked by the applicable 15-day deadline to be effective. You are not required to send the letter by confirmed mail or return receipt requested, but it is recommended that you do so. Your request to be excluded will only be effective and enforceable if you can prove that the request was postmarked within the applicable 15-day deadline. Under California Civil Code sections 1798.83-1798.84, California residents are entitled to ask us for a notice describing what categories of personal customer information JustFab shares with third parties or corporate affiliates for those third parties or corporate affiliates' direct marketing purposes. That notice will identify the categories of information shared and will include a list of the third parties and affiliates with which it was shared, along with their names and addresses. If you are a California resident and would like a copy of this notice, please submit a written request to the following address: JustFab General Counsel, 800 Apollo Street, El Segundo, CA, 90245. In your request, please specify that you want a "Your JustFab California Privacy Rights Notice ". Please allow 30 days for a response. These Terms of Service constitute the entire agreement between you and JustFab and govern your use of the JustFab Services, and they supersede any prior agreements between you and JustFab. You also may be subject to additional terms and conditions that are applicable to certain parts of the JustFab Services. JustFab may terminate this Agreement and deny you access to the JustFab Services at any time, immediately and without notice, if in JustFab's sole discretion you fail to comply with any provision of these Terms of Service. You agree that no joint venture, partnership, employment, or agency relationship exists between JustFab and you as a result of this Agreement or your use of the JustFab Services. The failure of JustFab to exercise or enforce any right or provision of these Terms of Service shall not constitute a waiver of such right or provision. The invalidity of any term, condition or provision in these Terms of Service shall not affect the enforceability of those portions of the Terms deemed enforceable by applicable courts of law. You may not assign the Terms or any of your rights or obligations under the Terms without JustFab's express written consent. The Terms inure to the benefit of JustFab's successors, assigns and licensees. The section titles in these Terms of Service are for convenience only and have no legal or contractual effect. You can exchange your VIP monthly selection for another item, or return it for a credit or a refund. You can exchange any additional items purchased in a given month, or return it (them) for a credit or a refund, unless you acquired it (them) with a JustFab credit. Any items acquired with a JustFab credit can only be exchanged or returned for a credit. Obtain a Return Merchandise Authorization (RMA) number. This allows us to process your return. You can obtain a RMA number by calling our Fashion Consultants by dialing our toll free number at 1-866-337-0906. Our Fashion Consultants will email you our pre-paid return shipping label. Alternatively, you can obtain a RMA number online by clicking on the link in the 'My Order History' section in your Boutique. The risk of loss and title for products purchased on the Site or through the JustFab Services passes to the purchaser upon our delivery to the carrier. Replacement of products and credits to your account for shipped merchandise claimed as not received are subject to our investigation. We will adjust your account at our discretion. JustFab does not take title to returned items until the item arrives at our fulfillment center. At our discretion, a refund may be issued without requiring a return. In this situation, JustFab does not take title to the refunded item. JustFab is not required by law to collect sales and/or use taxes in all states, nor does it actually collect such taxes in all states. However, JustFab reserves the right to collect sales tax in any other jurisdictions if it believes that such collection is required by law. For states imposing sales or use taxes, your purchase may be subject to use tax unless it is specifically exempt from taxation. Your purchase is not exempt merely because it is made over the Internet or by other remote means. Many states require purchasers to file a sales/use tax return at the end of the year reporting all of the taxable purchases that were not taxed and to pay tax on those purchases. You may have a tax obligation in states where JustFab does not collect sales tax. Details of how to report these taxes may be found at the websites of your respective taxing authorities. To make purchases through the JustFab Services or to become a JustFab VIP you must submit credit card information. You represent and warrant to JustFab that such information is true and that you are authorized to use the payment instrument. You will promptly update your Account information with any changes (for example, a change in your billing address or credit card expiration date) that may occur. You authorize JustFab to use any updated credit card information submitted by your credit card company directly to JustFab. If you dispute any charges, you must inform JustFab within thirty (30) days upon receipt of JustFab's invoice. We reserve the right to change JustFab prices, fees or the number of Member Credits required to purchase items. Your continued use of the JustFab Services after the price change becomes effective constitutes your agreement to pay the changed amount. You are solely responsible for maintaining the confidentiality of your Account, all activities occurring under your Account and all access to and use of the JustFab Services by anyone using your Account, whether or not such activities and access are actually authorized by you, including but not limited to all communications, transactions and obligations. You agree to accept responsibility for all activities that occur under your account and password. JustFab shall not be liable or responsible for any loss or damage arising from any unauthorized use, access or any other breach of security of your Account, including but not limited to your member sign-in password and email address. You acknowledge and accept that your use of the JustFab Services is in compliance with these Terms of Service. You further acknowledge and accept that JustFab shall have no obligation to investigate the authorization or source of any Account activity, including purchase activity following a proper log-in to this Site or any JustFab Services, which is defined as a matching and current member sign-in and user password. You shall notify JustFab immediately of any unauthorized access to your Account or any other unauthorized use of any JustFab Services. You agree that JustFab may, without prior notice, immediately terminate, limit your access to or suspend your Account based on any of the following: (a) breach or violation of these Terms of Service; (b) upon request by law enforcement; (c) unforeseeable technical or security issues or problems; (d) extended periods of inactivity; or (e) fraudulent, deceptive or illegal activity, or any other activity which JustFab believes is harmful to its business interests: or (f) for no reason. You agree that any termination, limitation of access and/or suspension shall be made in the JustFab's sole discretion and that JustFab shall not be liable to you or any third party for the termination, limitation of access and/or suspension of your Account. Any and all content, comments, feedback, suggestions, ideas, concepts, photos, questions or other communications (collectively, "User Content") that you submit or post through any JustFab Services shall be deemed non-confidential and non-proprietary. By submitting or posting any User Content, you grant to JustFab and its affiliates a perpetual, irrevocable, royalty-free, worldwide, sublicensable and transferable license to copy, publish, translate, modify, create derivative works from, distribute, reproduce, display, or use the User Content in any commercial or non-commercial manner whatsoever. JustFab will be free to use any ideas, concepts, know-how or techniques contained in such User Content for any purpose whatsoever, including but not limited to developing, manufacturing and marketing products that incorporate or otherwise rely upon such information. JustFab shall have no obligation to monitor User Content, use or display User Content, compensate you for submitting User Content, or respond to any User Content. JustFab retains the right, in its sole discretion and without prior notice, to remove, revise or refuse to post any User Content for any reason or no reason. If you utilize your Facebook account to access and use the social features available through the JustFab Services, you can choose whether or not you wish to share content or information related to your Account on Facebook. You agree that JustFab is not responsible for any content or information related to your Account once it is shared and posted on Facebook. If you use the JustFab Services and its social features, you agree to respect other users of the JustFab Services in your interactions with them. JustFab reserves the right, in its absolute discretion, to disable your account if it believes that you are violating any term or condition set forth herein. By submitting User Content, you represent and warrant that the User Content does not (i) contain false or misleading information, (ii) infringe on the intellectual property rights of any third party, (iii) contain any libelous, defamatory, obscene, offensive, threatening or otherwise harassing content, (iv) contain any addresses, email addresses, phone numbers or any contact information, or (v) contain computer viruses, worms or other harmful files. You are solely responsible for the User Content and you hereby agree to indemnify and hold JustFab and its employees, agents and affiliates harmless from any and all damages, claims, expenses, costs or fees arising from or in connection with a breach of any of the foregoing representations or your violation of any law or rights of a third party. Prices, descriptions and availability of products are subject to change without notice. Errors may be corrected when discovered, and JustFab reserves the right to revoke any stated offer in order to correct any errors or inaccuracies. Although JustFab has made every effort to display our products and their colors as accurately as possible, the displayed colors of the products depend upon the monitor of the user, and JustFab cannot guarantee that the user's monitor will accurately portray the actual colors of the products. Products displayed may be out-of-stock or discontinued, and prices are subject to change. JustFab is not responsible for typographical errors regarding price or any other matter. All orders placed through any JustFab Services are subject to JustFab's acceptance. This means that JustFab may refuse to accept or may cancel any order, whether or not the order has been confirmed, for any or no reason, and without liability to you or anyone else. If your credit card has already been charged for an order that is later cancelled, JustFab will issue you a refund. All content, graphics, text, code and software used on or incorporated into this Site and/or any JustFab Service, and the arrangement or integration of all such content, graphics, code and software, are subject to copyrights held by or licensed to JustFab and all rights thereto are specifically reserved. As between you and JustFab, (or any other company whose marks appear on any of the JustFab Services), JustFab (or the respective company) is the owner and/or authorized user of any registered or unregistered trademark, trade name and/or service mark appearing on any of the JustFab Services, and is the copyright owner or licensee of the materials and content contained therein, unless otherwise indicated. The JustFab logos, designs, titles, phrases, product names, photographs, images, videos and content and the copyrights, trademarks, service marks, trade dress and/or other intellectual property in such materials (collectively, "JustFab Intellectual Property") are owned by JustFab and may be registered in the United States and internationally. You agree not to display or use the JustFab Intellectual Property in any manner without JustFab's prior written permission. Nothing contained on this Site or in any of the JustFab Services should be construed to grant any license or right to use any JustFab Intellectual Property without the prior written consent of JustFab. Except as otherwise provided herein, use of the JustFab Services does not grant you a license to any materials, content or features you may access on this Site or via the JustFab Services and you may not modify, rent, lease, loan, sell, distribute or create derivative works of such materials and content, features or materials, in whole or in part. Any commercial use of the JustFab Services is strictly prohibited, except as otherwise approved by us. You may not download or save a copy of any of the materials and content or screens for any purpose except as otherwise provided by JustFab. If you make use of the JustFab Services, other than as provided herein, in doing so you may violate copyright and other laws of the United States and/or other countries, as well as applicable state laws, and you may be subject to liability for such unauthorized use. The information contained in the JustFab Services including, without limitation, all site design, text, graphics, interfaces, and the selection and arrangements is protected by law including, but not limited to, copyright law. JustFab publishes information within the JustFab Services as a convenience to its visitors. While JustFab attempts to provide accurate and timely information, there may be inadvertent technical or factual inaccuracies and typographical errors. We reserve the right to make corrections and changes to the JustFab Services at any time without notice. The JustFab products described in the JustFab Services may not be available in your region. JustFab does not claim that the information on this Site is appropriate to your jurisdiction or that the products described in the JustFab Services will be available for purchase in all jurisdictions. YOUR USE OF THE JUSTFAB SERVICES ARE AT YOUR SOLE RISK. THE JUSTFAB SERVICES AND THE PRODUCTS OFFERED THROUGH THE JUSTFAB SERVICES ARE PROVIDED ON AN "AS IS" AND "AS AVAILABLE" BASIS AND WITHOUT WARRANTIES OF ANY KIND, WHETHER EXPRESS OR IMPLIED. TO THE FULLEST EXTENT PERMITTED BY APPLICABLE LAW, JUSTFAB DISCLAIMS ALL WARRANTIES, EXPRESS OR IMPLIED, INCLUDING BUT NOT LIMITED TO, IMPLIED WARRANTIES OF MERCHANTABILITY AND FITNESS FOR A PARTICULAR PURPOSE AND NON-INFRINGEMENT. JUSTFAB MAKES NO REPRESENTATIONS OR WARRANTIES OF ANY KIND, EXPRESS OR IMPLIED, THAT THE OPERATION OF THIS SITE OR ANY OF THE JUSTFAB SERVICES WILL BE UNINTERRUPTED OR ERROR-FREE, THAT ANY DEFECTS WILL BE CORRECTED, OR THAT THE SITE OR THE SERVER THAT MAKES THE SITE AVAILABLE ARE FREE OF VIRUSES OR OTHER HARMFUL COMPONENTS, OR AS TO THE INFORMATION, CONTENT, MATERIALS, PRODUCTS OR SERVICES INCLUDED ON OR OTHERWISE MADE AVAILABLE TO YOU THROUGH THIS SITE, OR ANY OF THE JUSTFAB SERVICES, IN TERMS OF THEIR CORRECTNESS, ACCURACY, ADEQUACY, USEFULNESS, TIMELINESS, RELIABILITY OR OTHERWISE, UNLESS OTHERWISE SPECIFIED IN WRITING. JUSTFABSHALL NOT BE LIABLE FOR ANY DAMAGES OF ANY KIND ARISING FROM THE USE OF, OR THE INABILITY TO USE, THIS SITE OR THE JUSTFAB SERVICES OR FROM ANY INFORMATION, CONTENT, MATERIALS, PRODUCTS OR SERVICES INCLUDED ON OR OTHERWISE MADE AVAILABLE TO YOU THROUGH JUSTFAB, INCLUDING, BUT NOT LIMITED TO DIRECT, INDIRECT, INCIDENTAL, SPECIAL, PUNITIVE AND CONSEQUENTIAL DAMAGES, EVEN IF JUSTFAB HAS BEEN ADVISED OF THE POSSIBILITY OF SUCH DAMAGES. JUSTFABSHALL NOT BE LIABLE FOR ANY DAMAGES OF ANY KIND ARISING FROM THE USE OF THIS SITE OR THE JUSTFAB SERVICES ISSUED AGAINST YOU BY THIRD PARTY FINANICAL INSTITUTIONS SUCH AS BANKS OR CREDIT CARD COMPANIES. JUSTFAB SHALL NOT BE LIABLE FOR ANY OVERDRAFT, LATE OR ANY OTHER CHARGES ISSUED AGAINST YOU BY A BANK OR CREDIT CARD JUSTFAB. CERTAIN STATE LAWS MAY NOT ALLOW LIMITATIONS ON IMPLIED WARRANTIES OR THE EXCLUSION OR LIMITATION OF CERTAIN DAMAGES. IF THESE LAWS APPLY TO YOU, SOME OR ALL OF THE ABOVE DISCLAIMERS, EXCLUSIONS OR LIMITATIONS MAY NOT APPLY TO YOU AND YOU MAY HAVE ADDITIONALRIGHTS. IF YOU ARE DISSATISFIED WITH ANY PORTION OF THE JUSTFAB SERVICES, OR WITH ANY OF THESE TERMS OF SERVICE, YOUR SOLE AND EXCLUSIVE REMEDY IS TO DISCONTINUE USE OF THE JUSTFAB SERVICES. IF A PRODUCT OFFERED THROUGH THE JUSTFAB SERVICES IS NOT AS DESCRIBED, YOUR SOLE REMEDY IS TO RETURN IT IN ACCORDANCE WITH THE RETURN POLICY SET FORTH IN DETAIL IN THESE TERMS OF SERVICE. JustFab makes no warranties of any kind regarding any third party sites to which you may be directed or hyperlinked from the JustFab Services. Hyperlinks are included solely for your convenience, and JustFab makes no representations or warranties with regard to the accuracy, availability, suitability or safety of information provided in such third party sites. JustFab does not endorse, warrant or guarantee any products or services offered or provided by or on behalf of third parties through the JustFab Services. You agree to indemnify and hold JustFab and its subsidiaries, affiliates, officers, agents and employees harmless from any and all liabilities, claims, demands, actions, suits, losses, obligations, judgments, proceedings, damages, expenses and costs (including reasonable attorneys' fees), based upon, arising from or related to (a) information or content submitted, transmitted or otherwise made available on or through the JustFab Services by you or any other person accessing the JustFab Services using your Account; (b) the use of, or connection to, the JustFab Services by you or any other person accessing the JustFab using your Account (including negligent or wrongful conduct); or (c) your breach or attempted breach of these Terms of Service. You may also select 'Send Me New Options' within your Account, and our JustFab stylists will send you new apparel, shoe, handbag, or other fashion accessory options within five (5) business days. You will then have an additional five (5) days to either select an item for purchase or choose to 'Skip This Month'. Unless you choose to 'Skip This Month' within 5 days of receiving the additional options, your credit card will be charged an automatic monthly membership fee of $39.95 for that month and you will be issued one member credit. Again, each JustFab credit can be redeemed toward the purchase of JustFab item(s) in any future month. As discussed below, any unused membership credits will be automatically converted into an electronic JustFab gift card twelve (12) months following issuance. The electronic gift cards never expire and work the same as membership credits, except that they are transferable and can be used to purchase JustFab items of any price. Any membership credits issued to you will be automatically converted into electronic gift cards("JF Gift Cards") if they are unused following the twelve (12) month anniversary of issuance. As described below, JF Gift Cards function almost identically to membership credits, and both constitute prepaid promotional certificates that are provided to VIP Members in connection with the VIP Membership Program. JF Gift Cards can be used by you to purchase identified merchandise at a price below the regular retail price if you are a VIP Member at the time of redemption. Non VIP Members can also use JF Gift Cards to purchase JustFab merchandise at the regular retail price. Additionally, JF Gift Cards are freely transferable and can be broken and applied across multiple purchases on this Site or the JustFab Services. · Obtain a Return Merchandise Authorization (RMA) number. This allows us to process your return. You can obtain a RMA number by calling our Fashion Consultants by dialing our toll free number at 1-866-337-0906. Our Fashion Consultants will email you our pre-paid return shipping label. Alternatively, you can obtain a RMA number online by clicking on the link in the 'My Order History' section in your Boutique. · Send the item back in the original, undamaged box and packaging. · Attach the pre-paid return shipping label to your shipment and drop it off at any USPS or FedEx locations. · Forging any TCP/IP packet header or any part of the header information in any e-mail or transmission or posting to this Site.